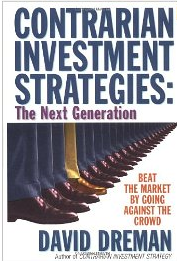 As mentioned in previous post, I just completed reading "Contrarian Investment Strategies" by David Dreman last week. The book contains over 400 pages, but author summarized the contents into 41 rules. Let's take a look at the 1st to 21st rules with Rolf's two cents opinion in italics. It is no expert comments and may be biased and wrong, please bear with me and appreciate any valuable opinions. Rule 1: Do not use market-timing or technical analysis. These techniques can only cost you money. Do not agree. TA is an important tool for Traders and provides indications of when to buy/sell even for long term investors. While frequent trading is discouraged, case by case trading is still valid. Rule 2: Respect the difficulty of working with a mass of information. Few of us can use it successfully. In-depth information does not translate into in­-depth profits. In-depth info is useful when it is organised properly, convert into action preceded by a plan. Sometimes I also rely on my “gut feel” after performing extensive research. Rule 3: Do not make an investment decision based on correlations. All correla­tions in the market, whether real or illusory, will shift and soon disappear. Rule 4: Tread carefully with current investment methods. Our limitations in processing complex information correctly prevent their successful use by most of us. Rule 5: There are no highly predictable industries in which you can count on analysts’ forecasts. Relying on these estimates will lead to trouble. Analyst info such as factual statistics compiled is useful for reference. Beware against forecast / estimates and perform your own research extensively. Always be conservative on Analyst reports. Rule 6: Analysts’ forecasts are usually optimistic. Make the appropriate down­ward adjustment to your earnings estimate. Rule 7: Most current security analysis requires a precision in analysts’ estimates that is impossible to provide. Avoid methods that demand this level of accuracy. Rule 8: It is impossible, in a dynamic economy with constantly changing polit­ical, economic, industrial, and competitive conditions, to use the past accurately to estimate the future. The past gives some frame of reference but cannot be exact. Rule 9: Be realistic about the downside of an investment, recognizing our hu­man tendency to be both overly optimistic and overly confident. Expect the worst to be much more severe than your initial projection. Rule 10: Take advantage of the high rate of analyst forecast error by simply in­vesting in out-of-favour stocks. Do not agree! Perform your own research. Buy stocks that possess the 3Rs - Right Management, Right Business Model and Right Value (FA). Rule 11: Positive and negative surprises affect “best” and “worst” stocks in a di­ametrically opposite manner. This means that if there are positive surprises that cause a rise in stock price, it will trend upwards in a faster manner, because people are expecting more out of the stock for a huge profit. Conversely, if there are negative surprises that cause a slide in stock price, it will trend downwards in a slower manner, because people are not expecting too much with a price decline. Have to do with Greed, kind of agree. (A) Surprises, as a group, improve the performance of out-of-favour stocks, while impairing the performance of favourites. (B) Positive surprises result in major appreciation for out-of-favour stocks, while having minimal impact on favourites. (C) Negative surprises result in major drops in the price of favourites, while having virtually no impact on out-of-favour stocks. (D) The effect of an earnings surprise continues for an extended pe­riod of time. Contrarian advocates that we buy out-of-favoured stocks that have solid fundamentals because when positive surprises crop up, it normally goes up at a faster rate! On the contrary if you buy darling stocks, and negative surprises surface, it will fall dramatically. Kind of agree. One example is Super Group price free-fall due to the crisis in Thailand. Use to be a darling stocks with PE of 27. Hit by political crisis, PE drop to 16 and below at one stage. Rule 13: Favoured stocks under-perform the market, while out-of-favour companies outperform the market, but the reappraisal often happens slowly, even glacially. Rule 14: Buy solid companies currently out of market favour, as measured by their low price-to-earnings, price-to-cash flow or price-to-book value ratios, or by their high yields. Agree on the 4 strategies, but there can be situations that the out of favoured stocks stay unnoticed for many years (or for reasons unknown to retail investors), even when fundamentals seems to be strong. Examples Triyards and Marco Polo Marine within the O&G sector trading at PE way below their peers. Rule 15: Don’t speculate on highly priced concept stocks to make above-average returns. The blue chip stocks that widows and orphans traditionally choose are equally valuable for the more aggressive businessman or woman. Rule 16: Avoid unnecessary trading. The costs can significantly lower your re­turns over time. Low price-to-value strategies provide well above mar­ket returns for years, and are an excellent means of eliminating excessive transaction costs. Case by case, but keep trading to minimum. Rolf suggest trading cost within 1-2% of cost of investments. My average trading cost is 0.5%. Rule 17: Buy only contrarian stocks because of their superior performance char­acteristics. Rule 18: Invest equally in 20 to 30 stocks, diversified among 15 or more indus­tries (if your assets are of sufficient size). Diversification across industries is important but make sure your portfolio is sizeable to diversify and do not incur high trading fees. Rule 19: Buy medium-or large-sized stocks listed on the New York Stock Ex­change, or only larger companies on Nasdaq or the American Stock Ex­change. Rule 20: Buy the least expensive stocks within an industry, as determined by the four contrarian strategies, regardless of how high or low the general price of the industry group. Rule 21: Sell a stock when its P/E ratio (or other contrarian indicator) approaches that of the overall market, regardless of how favourable prospects may appear. Replace it with another contrarian stock. Case by case. Some smaller-cap stocks have PE above market value, due to their growth potentials. It does not mean that we should immediately sell. One likely example is Vallianz holdings. Refer to next post for Rule 22 to 41 ……..